In 1990, the United States passed the Americans with Disabilities Act (ADA). We owe modern design of dishwashers to this law including doing away with cumbersome or unwieldy features like levers. These days ADA compliant dishwashers refer to the height of the product itself. ADA-compliant dishwashers are approximately 32 inches tall (mind you the legs can be adjusted to a degree based on the chosen model) as opposed to the 33-34 inch height that’s standard on most other dishwashers. This can be a problem if your previous cabinets and flooring were installed around a standard dishwasher, and you now require an ADA height dishwasher instead. But if you have lower counters or raised floors already, an ADA height unit will serve you perfectly. You might wander what else is important when considering an ADA compliant dishwasher? The primary consideration is that everything from controls to knobs and racks must be reachable from the front with one arm. The racks must also be designed for easy dish placement, but fortunately, most modern dishwashers are already designed with this in mind. ADA dishwashers are also the same standard widths (18” and 24”) as other dishwashers, so you don’t have to worry about width or depth compatibility. So what else matters when choosing an ADA dishwasher, not just in terms of accessibility but in overall quality? Generally, four main elements make a great dishwasher—quietness, design, cleaning ability and drying ability. Let’s take a look at each feature with a little more depth. Quiet operation is one of the most requested and sought-after features in modern dishwashers today. Because the dishwasher is usually located in the middle of your kitchen and dining area, and often near the living space, a noisy machine can disrupt family time or gatherings. This is even more relevant now that Energy Star requirements have led to longer washing cycles than before. Numbers can often be confusing when it comes to noise levels, so we’ll offer some references to help you understand where a specific model will be on the noise spectrum. Dishwasher noise levels range from as low as 38dB up to 60dB. The sound of a quiet library is about 40dB, while 50dB is about the sound of light traffic and 60dB is the noise level of an average conversation. As Designer Appliances, we suggest to stay between 44-48 dB for optimum quietness. 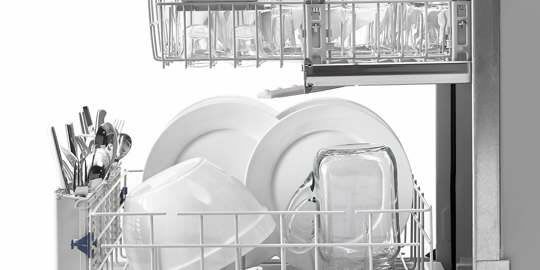 If you want more information on the topic of noise, consider checking out our article on the most quiet dishwashers for a deeper look at dishwasher noise levels. You’ve probably already noticed that dishwashers come in a wide range of styles, designs and types. From basic dimensions like width (18” narrow dishwashers vs. 24” standard designs) to finishes (stainless steel, fingerprint resistant, etc. ), you can find all kinds of variations to suit your unique needs and preferences. If you want an extremely custom look for your kitchen, there are panel-ready dishwashers available that can be finished with a cabinet-matching front façade that will blend effortlessly with your existing décor. There are even portable dishwashers on wheels that can be moved in and out of your kitchen when not in use. ADA dishwashers, on the other hand, are highly compatible for installation in lower countertops and apartments with less space than others. Other features that can be integrated into the design of your dishwasher include built-in water softener for better performance and less long-term wear on your dishes and your dishwasher. All of the design style in the world won’t mean much if you’re dishwasher doesn’t clean well. Fortunately, the range of dishwashing cleaning ability is wide enough that you can find a quality cleaning experience in an inexpensive package. Meanwhile, you do have to look out for cleaning “features” that don’t really do much but raise the price of your machine without adding actual cleaning ability. Look for dishwashers with a high number of spraying nozzles, and high-pressure capability. You’ll also want a bit of variety in cycles and rinse styles to adapt to your unique loads and dish types. Additionally, it’s important that your dishwasher offers enough racks that are effectively spaced for maximum cleaning power. You don’t want your full loads to be left half-washed just because they were too tightly packed. Overall, most modern dishwashers do an effective enough job at cleaning. But be on the lookout for poorly-reviewed dishwashers with a reputation for bad cleaning performance. If you do that, and complete your research effectively, you’ll be just fine. What good is a dishwasher if it’s no good at drying your dishes when it’s done cleaning them? Many people underestimate the importance of quality drying ability, or misunderstand what’s necessary to ensure their dishwasher dries well. One of the most effective features to help in drying is a stainless steel internal drum. The condensation capabilities of this material over plastic are significant, so if you want a truly effective drying experience after every cycle then consider a dishwasher with a stainless steel interior. Other drying features include fan-assisted drying, or a door that will automatically crack open after a cycle in order to allow ventilation for faster drying speeds. Generally, it’s important not to neglect effective drying ability when buying a dishwasher. Choose a model with a track record for both quality and dependable washing and drying ability, and you won’t regret your decision. Here are some quality ADA-compliant dishwasher models to consider, as well as some basic stats about them. This ADA-compliant 24” SGX68U55UC from Bosch brings all of the best features from Bosch’s 800 series in a clean, minimalistic modern package. Here are some of the best features. If you want to learn more about Bosch Dishwashers, check out our review article. Including the new dishwasher models introduced this year. DishDrawers are extremely luxurious options that are a pleasure to use. The doors open like smooth drawers, offering easy dish placement and a sleek, modern design. This Fisher Paykel model DD24DAx9N is compliant with all ADA regulations. Learn more about Fisher & Paykel in this dedicated article from Designer Appliances. Miele is producing some of the highest-quality dishwashers available on the market today, though they do come with a relatively high price tag. But don’t fret, they also offer a longer life and more features than their cheaper competitors. Here are some features available in their G4993SCVi model. Learn more about Miele Dishwashers in our earlier article. Bosch doesn’t have just one great 800-series dishwasher—this SPX68U55UC model is also ADA compliant and comes with a compact 18” design without sacrificing any advanced features. If your dishwasher rests below the current flooring level, you should consider getting an ADA compliant dishwasher for its shorter height profile. Just be sure to confirm that the distance below the counter to the raised portion of the floor is correct for the dishwasher you choose. And remember—not all dishwashers are created equal. By keeping the above-mentioned factors in mind, you’ll choose a dishwasher that not only fits your kitchen space but also fits your lifestyle and needs. In case, you are interested in a standard dishwasher you will find our latest dishwasher buying guide handy.